peanut butter cookie stack, originally uploaded by shaunaforce. Look at those cookies. Aren't they gorgeous? Can you believe they are gluten-free? I made up this recipe, about a month ago, after catching the last half of a sentence of a woman on the street. 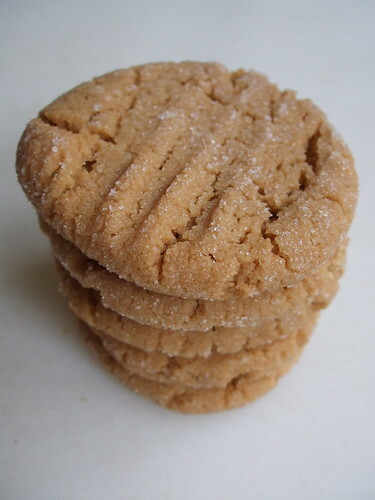 As I walked past her on the sidewalk in Madison Park, I heard her say, "...don't need flour to make peanut butter cookies..." She walked into a store with her friend, and I didn't hear the rest. It doesn't take much more than that for my mind to start racing. In the middle of the afternoon, when the sentences stopped singing and my mind felt clogged, I walked into the kitchen and pulled out a jar of peanut butter from the refrigerator. The Chef was at his restaurant. No one else was in the house. If this small experimental batch turned out to be a disaster, who would know? They were anything but a disaster. The next night, Molly and Brandon came over for dinner. In fact, it was the night we ate pork chops with plum sauce. I had a few peanut butter cookies left over, sitting on the metal kitchen shelves. Want to try one, I asked? Last week, Molly emailed me and asked, "Hey, can I get your flourless peanut butter cookie recipe one of these days? I keep craving them..."
Of course, my dear. Here you are. However, if you want a real treat, you should eat dessert at the Chef's restaurant. He loves these peanut butter cookies so much that he started making them himself. He serves a little stack of them with chocolate mousse and a bittersweet chocolate sauce, as a parfait in a martini glass. Now that is decadence. Cream the peanut butter and sugar in a bowl. (As much as I love my KitchenAid, I have found that this is a hand-stirring job). Beat in the baking powder. Add the egg. Mix until it is all well combined. The dough will be sticky, so be prepared to get your hands messy. Roll some dough into a ball. (How big? That depends on you. I have found, however, that the smaller these cookies are, the better they hold together. Eat two instead of one!) Roll the ball into white sugar. Line a baking sheet, covered in parchment paper, with sugary balls of dough. Bake in the oven for about ten minutes. You will know the cookies are done when they feel coherent, but still a little soft. Take the tray out of the oven and let the cookies rest for at least five minutes. Afterwards, carefully transfer them to a cooling rack. After ten minutes or so, they will have hardened and be glistening with sugar. Makes ten to twelve cookies. These look so yummy. And it appears that they have the traditional fork-tine decoration, yes? Those are freakin' SPECTACULAR. I just might make them this weekend. I love these cookies and have been making them for several years. I keep having people send me your link since we're a bunch of gluten-free girls living here. I just keep forgetting to click on the link. glad I came over! Shauna, your cookies look lovely, and The Chef's way of serving them sounds tempting! umm, I am imagining these with fancy style butters, cashew, hazelnut or even chocolate hazelnut. oh pistascho. need to get in the kitchen. Are you using "natural" peanut butter in this recipe? Or the, uh, fake stuff? That dessert at the chefs restuarant sounds to die for... I am so bummed... cause I almost went there for dinner last week before I left town-- I am going to have to make sure to come back to Seattle to try it!!! This recipe is really great for my friends over in small european villages with no access to rice flour and such!! I will have to try it soon!! you can totally do these with any kind of nut butter. i do cashew butter with chocolate chips and a little vanilla for really low effort chocolate chip cookies. also, almond butter. then you make a little divet in the cookie with your thumb and fill with cherry jam right after you pull them out of the oven. I made them for a bunch of new friends who are completely unaware of gluten issues and they all gobbled them up in minutes. Thanks for the great recipe and all of the lovely posts. Tarynkay-you are so right! I made them with tahini for fun, it needs a bit more tweaking, but it was interesting. It never occurred to me to delete an egg and make cookies. Will try that very soon. these are so awesome, I made them last night, they are quick, easy, and might just be better than the ones with flour. thanks for posting this! Those do look just like the real thing. I have seen a very similar receipe even in my non-GF days, and as I recall, it made for pretty good PB Cookies. And, PB Cookies are always a good treat! 2 quick baking questions: You say to cream the PB and the sugar in a bowl. Do you use all the sugar to do this? I ask because later you say to roll the ball into white sugar - is this more white sugar? Also, do you mix and beat all these ingredients by hand or just cream the PB and sugar by hand? Try using Splenda instead of sugar for more calorie cutting. You won't taste the difference. Yummy! I hope you won't consider it an insult when I say these taste like the inside of Reese's Pieces:). I don't have celiac but I don't think I'll ever go back to making PB cookies the gluten way ever again. Three cheers (at least)! I did some math... which is scary... and calculated that if you make the cookies small (my batch made 25 cookies) their only 115 cal per cookie! Not bad! I just found out last week that I had celiac. I just made these cookies and they are exactly what I have been looking for for years!! Regular peanut butter cookies have never been peanut buttery enough. Thank you so much for sharing this recipe!!!! I can't wait for my husband to get home so he can try a cookie. . I just found out that I have celiac last week. I just made these cookies and they are exactly what I been looking for for a looong time. Peanut Butter cookies with flour have never tasted peanut buttery enough. These do! I love to cook and am looking forward to trying more of your recipes!! I can't wait for my husband to come home so he can try a cookie. I am having to fight my 20 year old son to keep out of them:) Thank you for sharing this recipe!! Oooh yes. I just had a double blind taste test -- David Lebovitz' PB cookies (with gluten), versus these ones. Yours won! (But David's are good too, of course!). Yesterday, we recieved a box of Halloween cookies and instead of denying myself treats, I made these cookies and they hit the spot! I am SO HAPPY that a friend forwarded your blog to me. I went gluten-free two weeks ago (would have been nice to know about this whole gluten intolerance bizness 10 years ago when I was diagnosed with IBS and told to "reduce stress" to reduce symptoms, which never worked) - and this was my first baked treat. THANK YOU. I was a bit worried that I was condemned to a holiday season spent coveting those yummy cookies w/ the chocolate kiss in the middle, but I'll just make my own version! I sometimes make these with honey instead of sugar--just use 3/4 cup to 1 cup of honey instead of the sugar. Even with the extra liquid the cookies come out fine. Neat, I made some like that and put chocolate chips in them, and gave some to one of the guys from my church that is gluten intolerant and boy he had to try them before he left. I make bread for him and I, so it makes it nice when he buys the flours and stuff for me to make them. I gave him your site too, and hope that he has checked it out. I've been gluten free for a little over a month, but I'm also sugar free, dairy free and egg free. I made these cookies with splenda and I love them! The only thing, is I wouldn't roll them in Splenda the next time, I would just sprinkle some on top. I was looking for something sweet, and I've finally found it. They are so easy, and I bet they would be awesome with some sugar free/gluten free chocolate chips! Thanks for the recipe. I just made these for the second time. I keep meaning to add chocolate chunks or kisses on top but I get too excited to make them that I forget. I just posted about them with only slight changes. I had a great idea for modifications using my recipe for cinnamon currant or dark chocolate flavored peanut butter on my site, but have yet to test it. You can see the original post here: Flourless Peanut Butter Cookies but I'll let you know when I use one of those flavored peanut butters (they're gluten-free as well!). Being a college student, it's always great to find quick and easy gluten-free recipes like these! I made them with raw sugar instead of granulated white sugar---gives them a bit of a crunchy texture. Yum! Thanks for all your wonderful recipes! Thanks so much for this recipe! I used a cookie press-as I often do for GF cookies and it worked out fabulous! SPECTACULAR! Thank you so much! i'd love to try them---do you think i can substitute agave nectar for the sugar? should i use less egg to compensate for the agave liquid? mmmmmmmmmmmmmmmmmm... that's the only word to describe these cookies! I know this is an old post, but just found you recently. BFF is gluten-free and am always trying new recipes for her. I make a version of this with powdered sugar instead of granulated and it works wonderfully. Have to hide them from the crumb-grabbers though. I like to place the dollops on a cookie sheet, and place it in the freezer. After 5-10 minutes, the dollops roll beautifully into balls, before I press them with a fork, and place them in the oven. I made these last night and they were fantastic, none left this morning! Cookies you eat with a spoon??Help! I tried this recipe twice in the last 2 weeks and the cookies turned to dust each time. (dont worry i didn't throw them away..it still tasted good! )The only thing about the recipe i changed was that I used Splenda instead of sugar and a "Natural" PB instead of the regular kind. Im doubting it...but could either of these have made the cookies not "stick" together? Is there a certain brand of PB i should use? Thanks !!! These work great for thumbprint cookies! I doubled the recipe and still had to make another double recipe! I just made these to share w/a friend who has a gluten-free diet. They are delicious. I used a melon ball scooper to dish them up and they turned out awesome and all the exact size and shape. Thanks for the great recipe. Thank you so much! My son and I are going GF, he's 5 and pb cookies are his (and my) favorite thing on earth! I used organic natural peanut butter and did have a bit of trouble with them being more crumbly than I like, but they were yummy! Thank you so much for the fabulous recipe. My mom, who has Celiac Disease, was so excited today when I made them for her. She always made the best peanut butter cookies, and now, she can still have them! Mine made 24 cookies, and my Kitchen Aid worked perfectly as did not using parchment paper. WOW! I just found this recipe and made a double batch to freeze. They are wonderful! My husband can't quit eating them. Good thing I got some in the freezer before he tried them. I also added a 1/2 tsp of vanilla. I've been making these regularly since you first posted the recipe years ago! They're really good with a little over half a cup of semi-sweet chocolate chips in them, too. mmmmmm! I'm 16 and went gluten free 6 months ago. I really wanted a cookie and well now I have one :-)! I'm reading your book right now and it's making everything easier! I just made these with hazelnut butter, stuck two together and made sandwich cookies with Nutella filling. Awesome! Make cookies small: the hazelut spreads out like lacies. These cookies taste WAY better than a normal everyday peanut butter!! I made these for someone else that can't have dairy or gluten and they were amazing! I think I am going to make these from now on!! THANKS! can't wait to try the variations, too! thank you. I got around the sticky dough problem by refrigerating the dough for an hour or two. These are darn good cookies. I went to make these but had no eggs so I used crunchy peanut butter, a small container of applesauce and fructose sugar, blended and added to brown rice flour, a bit of potato flour and a bit of tapioca flour with baking powder and salt sprinkled in. I tried some as balls (got brown on top but good texture) and flattened the rest with my fingers (seemed a little tough). Then I saw, and remembered, the fork technique! Will try next time. May add some cinnamon, too. Would anyone know if it would be possible to add nuts? My family loooves nuts in everything, so just wondering if anyone knew if it would still work? I've been making these cookies for years and everyone loves them! My kids like to make them into Reindeer cookies for Christmas by pinching the middle of the flattened cookie to form a reindeer shaped head, adding small Glutino pretzel twists on top for antlers and Sunspire Sun Drops (candy coated chocolates with no artificial colors since my daughter has a horrible reaction to red dye)for the eyes & nose. My boyfriend and friend were teasing me about not baking cookies over the holidays - really, I think they were just hoping I'd make some. It's Christmas Eve and all the stores were closed. I needed to find an easy recipe and found yours. I didn't have an egg so I substituted egg replacer and the cookies turned out amazing! And my loved ones were surprised by what I could turn out in 15 minutes! Thank you for your help. I have made these several times now, and I have found that using half white sugar and half brown sugar works best (for me). This change gives a chewier texture that I like. I also add about a half teaspoon of GF vanilla extract. The other thing I have noticed when making these flourless cookies is that you need to be a little cautious when choosing your peanut butter. Some of the store brand varieties have too much added sugar and/or are too "oily" even when mixed. Thanks for helping me rediscover this recipe! I used to make them in my pre-gluten free days, but had forgotten about them. They are delicious! I gave some to my dad, who is does not eat g-free, and he said they were the best he'd ever eaten! Seriously. I made FOUR batches of these this weekend. EVERYONE loved them (GF or not). Amazing...thank you sooooo much for sharing! i love these cookies already, but i just tried them with homemade peanut butter (http://blogs.villagevoice.com/forkintheroad/archives/2009/12/recipe_9.php) and they are fantastic! i used quite a bit less sugar, since the pb recipe has a fair bit, and i added chocolate chips. made for a more chewy cookie, really delicious. These cookies are so good. My mom was so excited to eat a peanut butter cookie after being on a gluten free diet for 25 years! Just made a variation using homemade hazelnut butter and powdered honey (subbed for the white sugar, which I don't eat). A splash of vanilla extract and we were off to the races! I've made 3 batches of these cookies since finding your recipe recently. We've made hazelnut, peanut butter and pepper hazelnut. All have been incredibly well-received. Well, tonight my husband was begging me to make another batch of pepper hazelnut, and as I was feeling like a bit of a mad scientist (my discovery of gluten-free cooking has been SO MUCH FUN!) so I took this basic recipe and RAN with it, experimenting with a bunch of wacky ingredients. The results are absolutely amazing, so I thought I'd share the recipe! Preheat oven to 375. Prepare cookie sheet: line with parchment paper and spray lightly with cooking spray. In food processor (or by hand), mix all ingredients, adding into processor in order listed above. Dough will be extremely sticky. Measure out by heaping teaspoon, rolling into balls (I suggest wetting your hands slightly to keep the dough from sticking). Dip a fork into water and flatten the balls gently, creating a criss-cross pattern on top. Bake for 8 ½ minutes (my oven runs hot) for amazingly chewy cookies, slightly longer for crunchier cookies. Enjoy! I've made a VERY similar recipe. No baking powder, just 2 cups peanut butter, 2 cups sugar, 2 eggs. I usually add mini chocolate chips, about a cup. No need to roll in sugar, grease the pan or use parchment paper. Make like drop cookies. Dough cooks at 350. Is still shiny when done at 9 or so minutes. I love the protein content for my little boys. I made these cookies last week with Peanut Butter & Co's Dark Chocolate Dreams GF peanut butter....they were fantastic! Thanks for all your yummy recipes! I am going to try this with their cinnamon raisin swirl next, can't wait! just made these. OH SO GOOD! i used less sugar, like 3/4 cup and still yummy! I am new at this gluten free stuff. I was so happy to see I could make some yummy cookies without having to buy a million kinds of new flour! And these cookies were yummy!!!!!!! I am still without a lot of GF staples, so when I saw this recipe I ran straight to my kitch. So delicious! I have felt deprived and a little down from going without. This recipe was just what I needed. A friend mentioned making chocolate chip peanut butter cookies and I got a hankering! Googled GF PB cookies and your site came up. THANK GOODNESS! These are so delicious! I made 1.5x the recipe, veganized it (flax instead of egg), and added chocolate chunks. Can't wait to take them to my sister's birthday party tonight! These are so so so good...thank you, Shauna! I 'used to' hate creamy peanut butter. Now I know it's good for and in something! I can't have sugar, so I substituted 12 Medjool dates (for 1 c. sugar), pitted and chopped them, then mixed everything in a food processor. I used Kroger's brand natural peanut butter which seemed oilier than Smucker's (what I usually have on hand). I didn't have any trouble with crumbly cookies. I can't thank you enough for this recipe. I'm pretty new to the world of gluten-free eating and have a serious milk allergy that I also recently discovered. Needless to say, it is pretty bewildering figuring out what to eat at first. Initially I was just so thankful not to be sick all of the time, but now I've started to miss some of those old treats. I thought my days of baking were over. Thanks for these delicious cookies! They are so yummy, and I plan to share them with the rest of my gluten-eating family. I started going gluten free today and was disappointed that we don't have gluten free flour yet, then I found this recipe. These are wonderful! I found the recipe a couple of hours ago and as soon as I found it I went in the kitchen and made them. Although I did add a small pinch of salt to mine. I made these cookies for a bunch of gluten free friends, the biggest hit ever! Only problem in the next couple of days i used a months store of our peanut butter. But it was worth it as i delivered them to my drooling friends! Hello from the UK - a good 4 years after your post! I'm thinking about going gluten free for a month to see if it helps with various health and energy issues, but was feeling pretty depressed last night when I thought about a world with no pizza, bread, or my usual baked goods - I'm an avid home baker. I then wondered if peanut butter would be allowed, so I googled it - and your post came up. Just baked these this morning in a sudden rush of energy before work, and they are delicious. I made a half batch as I was low on pb - I didn't have quite half a cup, so I whizzed some pecans into an almost butter. I used one small egg, but the batter was a little runny (as I guessed) so I stirred in a bit of gluten free cornmeal until it thickened up. They baked up beautifully. I just started gluten free a month ago and found your blog. Love it! This was the first recipe I have tried from you and it is so incredibly good! Thanks for all your hard work and information! I am living in a shelter and made a few batches of these for everyone. They loved them! Had to pass the easy recipe on to several moms! My first gluten free recipe. I used organic sugar which isn't as fine as granulated sugar so I am thinking they didn't turn out exactly right. They seem a bit gritty. The taste is great though! these cookies are awesome! i like to make treats for all my gluten-free friends, and they all LOVE this recipe, so thank you! My two sons are fatally allergic to peanuts, thus making peanutbutter cookies out of the question. However,I have found an awesome substitute-Sunbutter! It is a creamy sweet butter made from sunflower seeds in a peanut-free facility. It even has less fat than peanutbutter! It works well with this recipe! Thanks for sharing!